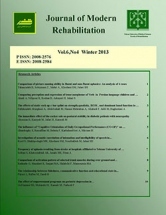 Journal of Modern Rehabilitation publishes articles relating to both clinical and basic science aspects of rehabilitation medicine in form of full-length paper, short communications, letter to editor, and reviews. It aims to be a wide forum for different areas of research in rehabilitation medicine, including functional assessment and intervention studies, clinical studies in various patient groups, papers on methodology in physical and rehabilitation medicine, epidemiological studies on disabling conditions and reports on vocational and sociomedical aspects of rehabilitation. It aims to be a wide forum for different areas of research in rehabilitation medicine, including functional assessment and intervention studies, clinical studies in various patient groups, papers on methodology in physical and rehabilitation medicine, epidemiological studies on disabling conditions and reports on vocational and socio-medical aspects of rehabilitation.